The child had been taken back to Elsa’s mother and, when he heard what had happened, Dr Craven had insisted that a small amount of money be sent each month so that she would not be in hardship. The young maid would be allowed to visit her son each Wednesday evening, as well as the usual Sunday afternoons, if she wished. Emily watched Dr Craven’s eyebrows raise as James continued. Dr Craven shook his head sadly. He left the room and James stood up and walked to the window. He turned suddenly from the scene as if vexed by it, and studied her face. There was an unusual brightness in his eyes. Emily was surprised; she had thought him settled at Wenton, but the city was not so far away now the new toll road had opened. “To fight?” A fear gripped Emily’s heart. Emily bent her head so that James would not see the tears in her eyes. Emily looked up and saw the earnestness in his eyes. Confusion filled her. As he traced a tear that had fallen down her cheek and gently touched his lips to hers, Emily knew what her answer would be. The bells rang out across the valley as the coachman clicked at the horses and the open carriage swayed along the rutted path. To either side, beneath the trees, the ground was a sea of bluebells, their heady scent filling the air. Emily sat with her gloved hand in her husband’s and together they turned and looked back at the red-bricked house that had become her home. Its door and double row of tall sash windows, glinting in the afternoon sunlight, were just as she remembered when she had arrived as a new governess. How long ago it seemed. A procession of villagers and many of the staff of Babcock Manor had lined the verges of the lane, calling out their good wishes and throwing rice. One face caught her attention, her pale freckled face smiling out from a mass of ginger curls that would not be tamed beneath her hat. 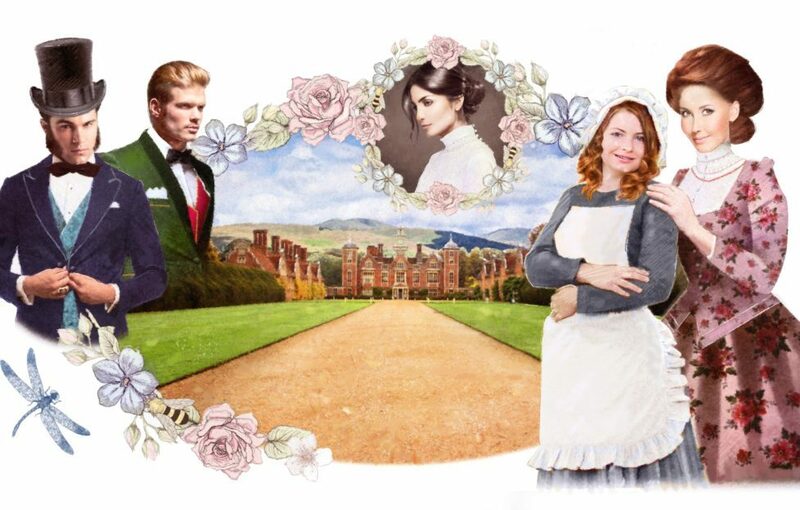 By her side stood a young footman, with a cheeky smile, his arm was around her waist and he looked fondly at her. Emily lifted her bouquet of white roses. She tossed the bouquet, with their blue silk ribbon, to the young maid, and for a moment, as they sailed through the air, it was as if time had slowed. Jenny caught them and held them to her chest, a smile breaking out across her face. Emily nodded to the driver and the carriage moved forward. She leant her head against her husband’s shoulder and, as Babcock Manor disappeared into the distance, she knew she was at the start of a new adventure.